The Yamaha YZF-R3 is a premium segment sports bike with top notch features and best in class technology. Coming in the 350cc segment this is a heavier sports bike made for the lovers of speed. The Super Bike comes with a 321cc engine which gives out a massive power of 41.4 bhp @ 10750 rpm giving out a maximum torque of 29.6 Nm @ 9000 rpm. Yamaha R3 can go up to a top speed of 188 kmph. It comes with standard 6 speed manual transmission which is common in this segment. The bike weighs 169 kg and has a ground clearance of 160 mm. The bike comes with a fuel tank capacity of 14 litres, which is good enough for people who like to travel distances in one go. The bike zips from 0 to 100 kmph in just about 6 seconds and accelerates from 0 to 60 kmph in a mere 2.89 seconds which is fairly impressive. The bike gives out a mileage of about 20-25 kmpl, which is not surprising given its high performance orientation. Also in this segment, mileage is not a selling point. The bike comes with attractive twin 55W Halogen bulb headlights. The bike comes with disc brakes and telescopic fork suspension. Yamaha has always been a trendsetter and the Yamaha YZF-R3 is no exception to this. 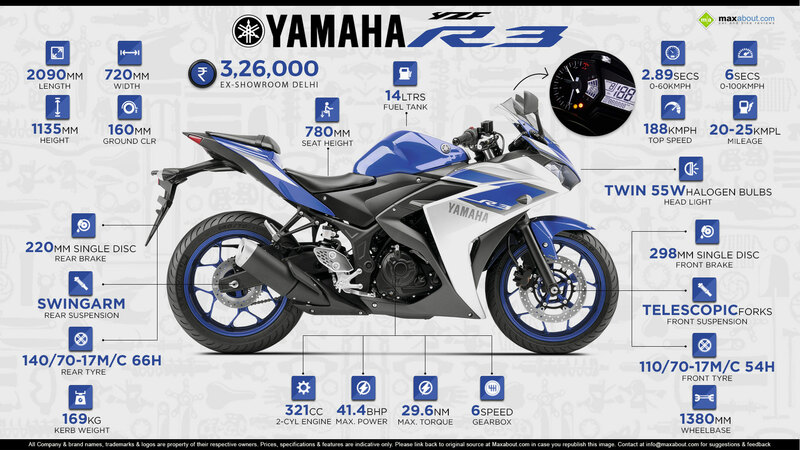 In this segment YZ- R3 is often compared to KTM RC 390, Kawasaki Ninja 300 and Honda CBR300R. Although all these racing bikes come in varied price ranges, the selling point in this area remains the performance of the bike and preference of the buyer towards the maker. Overall, YZF-R3 takes the piece of cake as a touring sport bike and also a winner on the race track. Click here to know more about 2016 Yamaha YZF-R3. Downloaded 74 times this week.